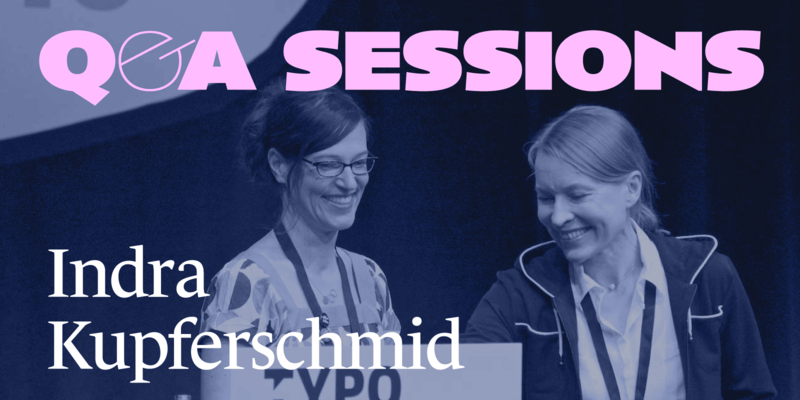 Our first Q&A is with Indra Kupferschmid, a freelance typographer, professor, and co-founder of Alphabettes, a showcase for work, commentary, and research on lettering, typography, and type design. Indra has worked on many gorgeous sites for Webtype and Font Bureau, co-written a book about Helvetica and even worked with Fontstand on their filtering system. Read more about her in her TypeParis bio. Indra created the text and images for this website about Benton Modern, a beautiful typeface from Webtype. Indra Kupferschmid: I don’t actually know. I like that it’s a quieter art, compared to photography, illustration and more graphic communication design. I like that it’s about details. And structure. I got into it from a scientific interest, not actually majoring in arts in high school. When I learned about type I thought; this is something complex and principle-based I’d like to explore. I think right now is pretty exciting! I would love to relive the past 5 years maybe because I feel that they went incredibly fast and I missed some parts of them. I don’t think so. Or if so, then in a gradual, evolving manner – a good thing. Things around me have changed, tasks, challenges, colleagues, jobs… but I think I have the same basic approach to things I take on. Maybe less fearful than in-between. With experience and confidence, I’ve sort of gotten back to the recklessness of student years. What is you favourite magazine/movie/T.V. series? Oh dear. I am out of all the pop culture I have to admit. I don’t read much printed media anymore, I seldom watch movies, mostly on planes, and I don’t have a TV nor Netflix or the like and I hardly watch shows. I buy them on iTunes if I feel like I must. I did watch the full Mad Men set though and very much enjoyed it. I watched all of Parks and Recreation and like it. I like Doris Day movies, but from memory, haven’t watched any in a while. I love all by Wes Anderson (apart from maybe Bottle Rocket, that one is a bit weird) and the last movie I saw in the theater was the latest by Korean-German film maker Sung-Hyung Cho about life in North Korea. Very special topic but also very good, touching and insightful. All the traveling has made me a podcast girl. Indra with Sonja Knecht, at TYPO Berlin 2016 – Photo by Flickr user Jens_T. Well, at some point when you are working in typography and are passionate about it you want to find out how it is and works to make your own typeface. That was me in 1996. I then got my taste by learning and working with Fred Smeijers, made some horrible ones and one usable family (which I have no interest in publishing at all) and that was it until now. For many years I made bitmap fonts for consumer products and appliances that included chips too stupid to render outline fonts. I really liked that for whatever strange reason. The briefs were sometimes so ridiculously impossible, that totally spoke to the tinkerer and scientist in me. These jobs became quite rare now but every once in a while someone calls and need a set of bitmaps for a washing machine or the like. As for other fonts, I’m waiting for the need or idea for one that I or the world really needs. There are so many good typefaces out there I want to use. Why add another one to the pool if it doesn’t add anything substantial. Uff, no idea. I still can’t believe how I ever managed to write, design, and make the typeface for a typography book in three months, which I did in 1999. I was never able to recreate even a fraction of that focus and perseverance. I guess I was also so so much less distracted back then than I am now. Name something that inspires you? A good floor plan. And travel. Indra worked on the text, design and development for this website, taking a look at the many typefaces of Tobias Frere-Jones. Thanks Indra, great to hear from you! Make sure you register for the first #tptalks16 on Wednesday 22 June to hear Indra speak, along with Élise Muchir and Franklin Desclouds.